LG Display increases 4K OLED yield to 65% | What Hi-Fi? LG Display's plans to ramp-up OLED production are heading in the right direction, with reports suggesting the OLED panel yield has improved to 65%. Back in 2013, when mass-market OLED TVs were still something of a pipedream, OLED production yields were said to be around 10 per cent - so nine out of 10 panels weren't deemed good enough to use. This had a fairly disastrous effect on efforts to bring OLED TVs to market in any great quantity or at affordable prices. Now it seems LG Display, one of the biggest screen manufacturers in the world, has significantly improved that percentage. Korean website, etnews, reports an LG Display executive's claims that 65-inch and 77-inch Ultra HD OLED panels are now being produced with a yield rate of over 65%. Full HD OLED panels are now produced at a yield rate of 80%. The site reports LG Display aims to increase 77-inch, 65-inch, and 55-inch UHD OLED panel yield to 87%, 85%, and 75%, respectively, by the end of the year. 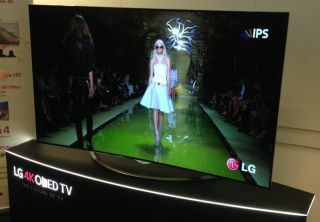 LG announced an expanded OLED TV line-up for 2015, and LG Display, which is a separate business within the wider LG Corp., has in turn looked to step-up 4K OLED production. LG's OLED targets are in contrast to its great rival Samsung, which said it wouldn't be releasing new OLED TVs in 2015.